Deck lighting with our LED deck lights paints your outdoor living space with soft light so you can linger on your deck, entertaining or relaxing into the evening. Illuminating your outdoor living or dining areas will let you take advantage of your landscaping investments and encourage you to enjoy your back patio well after sundown. 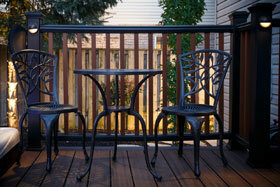 Guide your guests down to your yard past the deck step lights and enjoy a drink under the starry sky. Call us today, or fill in the form to discuss your personal moonlight. Spend some warm nights in the open air. You can create an enchanting atmosphere in your personal outdoor oasis, extending its nighttime use for many months of the year. Fixtures can be hidden in surrounding trees or concealed by your structures, or installed out in the open to add to the design theme of your living space. When you work with Moon Glow to create your custom lighting system, from deck lighting to garden lighting and beyond, you are sure to achieve the effect that you want while improving the functionality of your property too. Our discrete fixtures are unobtrusive and let the magnificence of your landscaping speak for itself. We provide fully programmable high quality fixtures and transformers for your exterior deck lights and more, and complete the programming for you. Your low maintenance system is comprised of durable and resilient hardware, backed by substantial warranties. 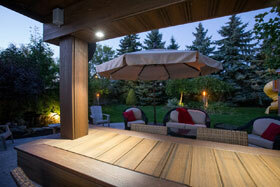 Request a consultation for deck lighting now and put your landscaped property at centre stage.